Read reviews: Journal of Social Work Education, The Midwest Book Review. 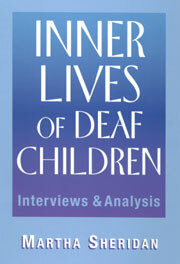 Inner Lives of Deaf children: Interviews and Analysis by Martha Sheridan (Associate Professor in the Department of Social Work at Gallaudet University) is an informative exploration into the lives of deaf children between the ages of seven and ten. Outstanding for its exclusive perspective and invaluable documentation of a deaf child’s struggles in contemporary society, Inner Lives of Deaf Children is an invaluable and seminal collection of studies and research into the psychology, lifestyle, and personal adaptation of deaf children. Inner Lives of Deaf Children is very strongly recommended to parents, teachers, social workers, counselors and anyone else involved in the lives of deaf children. Martha Sheridan is Professor, Department of Social Work, Gallaudet University, Washington, DC.